One election. Three ambitious candidates. Victory for one is death for the other two. Why are death and power always synonymous? The Games have been destroyed––can anyone stop him now? Lurking in the backdrop is a movement of greater threat still––their motives not always pure, their hands far from clean, and their reach beyond that of even Putin’s Kremlin. Enter the world of The Machine––for a long time hidden in the shadows; now time to step forward. MI6’s Alex and Anissa are getting closer––the list of criminal charges and unsolved cases growing, yet now they have names. With a secret new relationship and nothing heard from their FSB contact Sasha––Anissa soon fears the worst––tensions rise for the British agents who have got so far in their pursuit of these oligarchs. The Russian vote is proving to be the tightest contest in modern history––only one man can win, yet no one is backing down. From the Best Selling author of sixteen individual titles, including The Tablet, comes the fourth instalment in his much-loved Hunt series. ★★★★★ Oligarchs fight for power and influence in this fast-moving thriller. The Russian Presidential elections are approaching and would-be candidates will stop at nothing to win. This book is full of murder, intrigue and unexpected plot twists And can MI6 foil a terrorist attack in Tallinn and find out what is going on? This is a really exciting read. ★★★★★ The fourth instalment of this gripping thriller series. The fourth instalment of this gripping thriller series. Eagerly anticipating the fifth to see what happens next in this tale of political strategies and espionage. This book follows on from the previous three and it progresses the story started in the first book. Anissa, Alex and Sacha are still in play but the plot has moved away from The Game and has taken on a more sinister note involving the Russian elections. Another well-written book; Tim Heath has developed a very definite style and this story is no exception. Expect twists and turns and plots and counter-plots aplenty. ★★★★★ Fantastic! Political intrigue and a cliffhanger ending! Tim's books just get better every time! This was yet another page turner, and so relevant to the current situation with Russia! I couldn't predict where this would end and am left desperate to read the next book. Such a complex web of relationships and the battle for power. Well done Tim, another clever storyline that had me hooked! This book follows on from the other three! It helps if you have read the others as you are familiar with the characters! Another brilliant read Anissa Alex and Sacha are still in as are some of the others. This book follows the Russian elections and is very up to date. I won't give any more of the plot away. Another well written book which we have come to expect from Tim. Can't wait for the next one. 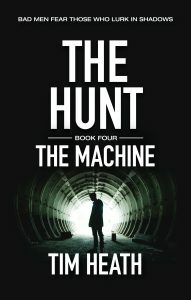 ★★★★★ The Machine is a fantastic book! Tim Heath did it again! You can never get enough of his work and “The Machine” is one of his great works. A thriller full of passion, agony and surprises. It is a must read this book of the Hunt Series. Wow, another great story in the Hunt series. I read this book in double-quick time, as I could not put it down. Highly recommended. Can't wait for the next one. ★★★★★ Never stops and totally engrossing! I always look forward to the next book in this series. This book did not disappoint; each book is chock-full of hints, clues, misdirection, surprises and twists. Tim Heath surprises me every time just when I think I have a handle on the story. The result is a straight through reading and then disappointment in myself for not having the self-control to stretch it out! That is ok; I bought the book and will reread it again. Just as I have reread the previous books. My enjoyment comes from not only the storyline but in the way it is presented. These books read smoothly, are not bogged down in descriptions, have pertinent dialogue, are not gory or filled with offensive language. In addition, the books are well formatted, clear of egregious misspellings, grammar whoppers and loose ends. Heath puts out the total package when he releases a book. They are a joy to read and engrossing to boot. The “Machine” of which Heath writes is alarmingly too close to what many believe of our governments today. Or, perhaps, select personages behind the scenes. At any rate, it is frightening. I would like to believe this is just a story — right? You will have to read this to decide for yourself what you think. Or, treat yourself to a great rip-roarin’ story. Either way, this book (actually, the whole series) is worth every penny spent in the experience of reading them. If it makes you ponder afterwards, that’s a bonus! ★★★★★ Barely Future Fiction Done Right! It's challenging to write a story that is, literally, a few weeks in the future when publication puts the dates in the very recent past. Tim Heath has done a remarkable job of pulling this off. The events of the story take place in early 2018 and pick up where Book 3 (The Poison) ended. While our intrepid team of Alex, Anissa, and Sasha are still involved, the focus of the story is eponymous “The Machine”. We learn that we have already met (directly and indirectly) its leadership. We follow the activities of three pretenders to the Presidency of Russia: Putin (of course) and two major payers from Book 3: Matvey Filipov and Dmitry Kaminsky. It is a great story of power and what money can do to promote that power. The story is intertwined with real people (e.g., Donald Trump) and events. The story is a bit less of the detective flavor of the first three books but has its share. This is an excellent start to the second Hunt trilogy and provides a story that is satisfying. The book starts out in St Petersburg, Russia, with an FSB agent running for his life which he loses the battle. The games in the last book have been stopped because one of the players has been killed. Fast forward to where Sasha is shot, and they are onto him for his spying. There is a presidential election going on for the new president in Russia. You will be shocked at who wins this. Alex and Anissa are still in the book and other characters. Overall a very good book, plenty of entertaining and suspense. The author always does a good job on his books wonderful done. I have no problem recommending this book. ★★★★★ Construction and character work are fantastic. This is the fourth book in the series I've read so far, and I have devoured every single one. This one marks the beginning of a new trilogy within the series, and it's plain impossible to put down. The writing, construction and character work are fantastic. I was sucked into the story from the very beginning and gripped the entire way through. I'm not sure how Tim Heath manages to release books that echo actual current affairs, the result is an amazing read. I have read the whole series, which helps, but this book could be read as a standalone. It is fascinating to see the progress Alex, Anissa and Sasha have made. It amazes me that Mr Heath can write so convincingly of events which are now taking place but hadn’t happened when he wrote the book. If you like believable political thrillers, you will enjoy this book as well as the whole series. ★★★★★ The Machine The best yet. I loved this book from the beginning to the end. Tim Heath is an excellent writer and his books flow smoothly and are easy to read. If you haven't read the other books in this series you should they are well worth it.